Kids grow up so fast. Once upon a time they were just sleeping in your arms, but now they finally get to have their own bed. But, it’s just normal for parents to worry. What if something happens to him at night—and you’re not there? This is why you should consider getting a bed rail. We did the research and have listed down what we think are the best bed rails for toddlers. We love the Regalo Swing Down Bed Rail Guard because it can be slid or pushed down when not in use. It’s also easy to install—just secure the anchor strap to the bed frame and that’s it! It’s made of durable stainless steel and has a mesh nylon cover to provide additional comfort. 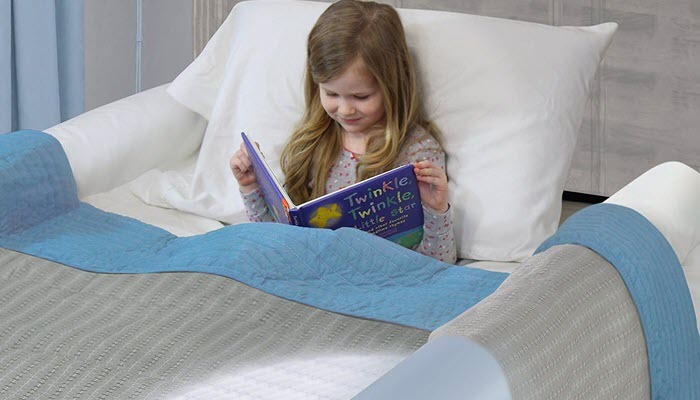 It is 20 inches high and 43 inches long and can be used on twin and queen-sized beds. So, this bed rail can’t be used on cribs, toddler beds, bunk beds, or platform beds. Just a reminder: this product only comes in one piece. So before buying this bed rail, make sure your toddler’s bed is placed against a wall just to be safe. What makes the ComfyBumpy Extra Long Toddler Bed Rail Guard great is it can fit any type of mattress. So if you have a twin bed, a queen bed, or a king bed, this one’s perfect for you! Installing it is also a breeze—just slide the slats included under your child’s mattress. This is a great feature especially for busy parents or those who have no skills in installing things. It’s made of high-quality metal with mesh covering. It is suitable for toddlers more than 2 years old, and like the previous product, can be folded down when not in use. You can choose between grey and white to fit the theme of your toddler’s bed. If portability is one of your priorities, then the Royexe Inflatable Bed Rail Bumper (2-Pack) is for you. 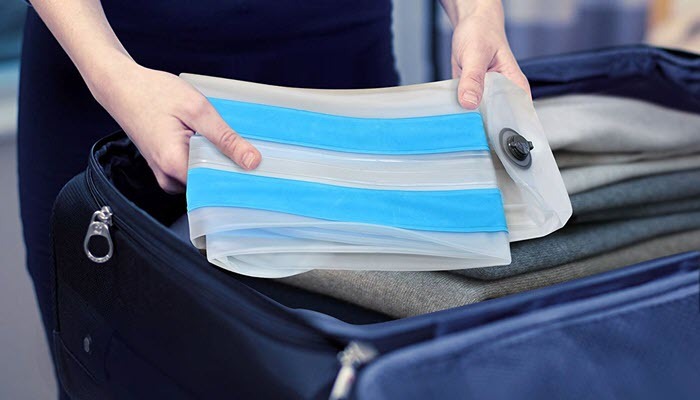 They inflate in seconds and when deflated, can easily fit inside your bag. Speaking of inflating, no pump is needed to set these bed bumpers up. Once inflated, just slip them under the sheets and they’re ready to use. These water-resistant rail bumpers have non-slip strips on the bottom to make sure they’re firmly secured to the bed. They fit any type of beds, from convertible cribs to king-sized beds. And though they’re filled with air, they’re really tough and can support up to 300 pounds. 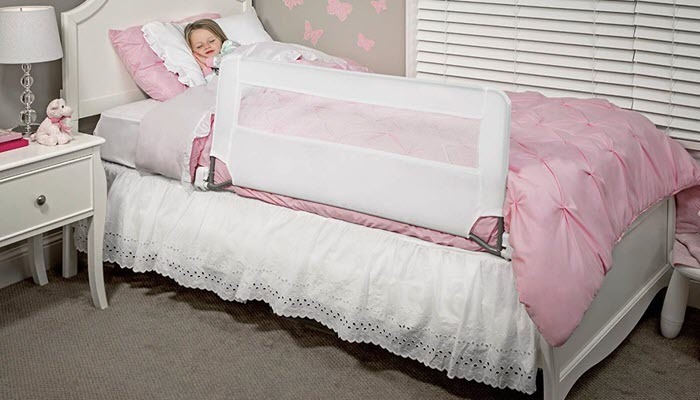 The Cutie Kids Premium Toddler Bed Rail Bumper is another choice if you love traveling a lot. 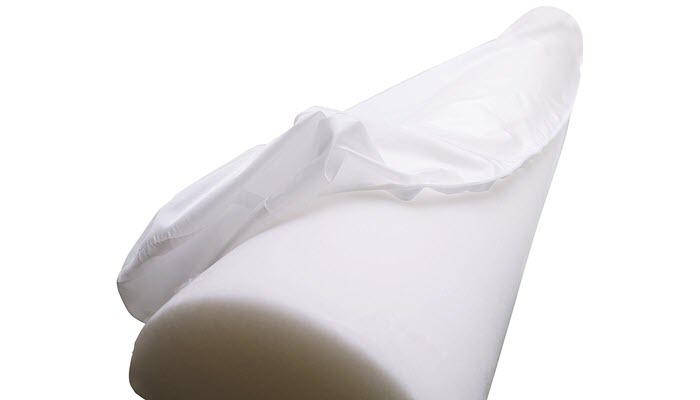 Unlike traditional bed rails, simply place this foam under the bed sheet and you’re good to go. Also, this bumper is BPA-free and hypoallergenic so it’s really safe for your little one. But, the best part is it comes in a washable cover. So when accidents happen, simply remove the foam from the cover, put it in the laundry, and it’ll be clean again like before. Nothing is quite disturbing like hearing a sudden thud from your toddler’s bedroom. You can’t control the way your toddler sleeps. So if he accidentally rolls over and falls, you don’t want him to end up hurting himself. A bad fall is a scary experience and may even cause damage to his spine. So aside from keeping him in his bed, he’s less likely to wander around his room and get into more trouble! Transitioning to a “big boy bed” with no crib bars is scary. This is where bed rails help since they make him feel more secure and contained. This is the whole point of getting a bed rail. There’s nothing more frightening than picking up a screaming toddler in the middle of the night—so having bed rails gives you peace of mind. These are the ones that are installed under the mattress. There’s a little space on both sides if your child wants to leave the bed. These are also the simplest and cheapest option. These are a great choice for older and more independent toddlers. Convertible bed rails are smaller and are used to replace one side of the crib. But, these are not adjustable—but they’re light enough to be removed quickly when needed. 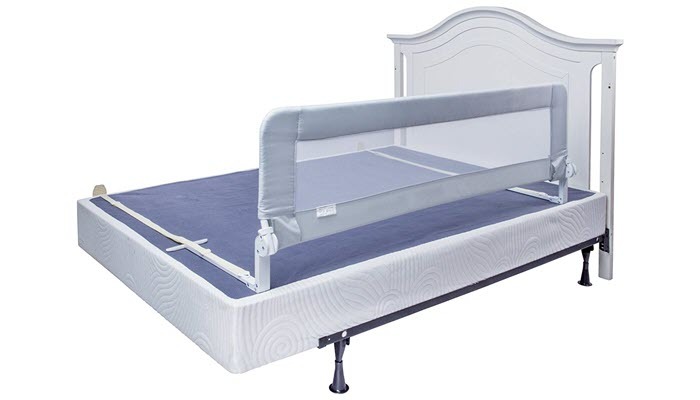 On the other hand, adjustable bed rails are lighter and can be adjusted to fit your mattress. Some can even be adjusted on how high you want them to be. These are great if your toddler occasionally calls for your attention at night. 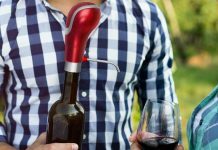 Or, maybe you want something that can be easily slid or folded down when not in use. Just make sure to lock them in place at night to make them more secure. And then unlock and fold them down in the morning when fixing his bed. 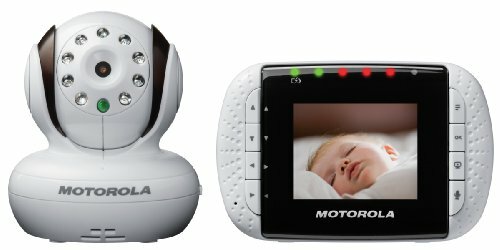 These are great options if you’re co-sleeping with your child in your bed. These come in pairs: one for the bottom and one for the side to protect his side of the bed. These are great if you don’t want any spaces on the side of the bed where your child can crawl up. Just remember that the larger the rail, the less adjustable and portable it becomes. These are often cheaper and more portable than bed rails. Inflatable and foam bumpers are basically large pillows that you put under the bed sheet. They are made of firm materials and have a washable cover, and can be installed in seconds. The Regalo Swing Down Bed Rail Guard is our choice as the best bed rail for toddler. It is long and high enough to give extra security and can be installed without using complex tools. If you are co-sleeping with your kid, you may want to learn more about the best bed rail for co-sleeping.